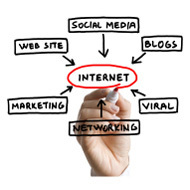 Internet Marketing, also known as web marketing, online marketing, webvertising, or e-marketing, is referred to as the marketing (generally promotion) of products or services over the Internet. Internet marketing is considered to be broad in scope because it not only refers to marketing on the Internet, but also includes marketing done via e-mail and wireless media. Digital customer data and electronic customer relationship management (ECRM) systems are also often grouped together under internet marketing. Internet marketing ties together the creative and technical aspects of the Internet, including design, development, advertising and sales. Internet marketing also refers to the placement of media along many different stages of the customer engagement cycle through search engine marketing(SEM), search engine optimization (SEO), banner ads on specific websites, email marketing, mobile advertising. + Display advertising: the use of web banners or banner ads placed on a third-party website or blog to drive traffic to a company's own website and increase product awareness. + Search engine marketing (SEM): a form of marketing that seeks to promote websites by increasing their visibility in search engine result pages (SERPs) through the use of either paid placement, contextual advertising, and paid inclusion, or through the use of free search engine optimizationtechniques. + Search engine optimization (SEO): the process of improving the visibility of a website or a web page in search engines via the "natural" or un-paid ("organic" or "algorithmic") search results. + Social media marketing: the process of gaining traffic or attention through social media websites such as Facebook, Twitter and LinkedIn. + Email marketing: involves directly marketing a commercial message to a group of people using electronic mail.